This customer has a beautiful new home on the mountain in Old Fort, NC. She wanted to make sure her appliances and fixtures were not going to be ruined by hard water in the well water. They Googled “water filtration businesses in Asheville,” and of course we were on top of the page. They read some of our blogs about recent installations and the testimonials. So they brought a water sample to the office for our free test offer. The results showed a low pH, Iron, and hard water. We gave our recommendations about the filtration system they needed. 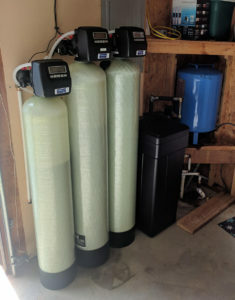 We installed a Neutralizer, Iron filter, and water softener. Now, they have perfect water that’s protecting all their appliances and plumbing.